On this page you’ll find links to different cities where there are certified nursing assistant classes in New York. Click on an individual city link to get more information about the training schools, including their address, phone number, and other important details. All of these programs have been approved by the NY Department of Health as of the writing of this post. Before enrolling in a certified nursing assistant training program you should always make sure it has been approved by the state. Approved programs will qualify you to take the certification exams which enables you to be placed on the nurse aide registry. Why You Should Consider Becoming a Nursing Assistant in New York? Enrolling in CNA classes in New York can be one of the best steps for those entering the healthcare field. There is a continuing demand for nurse aide workers in the state and the trend is said to continue for a few more years. Nursing assistant classes last only for a few months and if you pass the state competency exam, you can easily find employment for yourself. The tuition costs are also much cheaper than other courses regarding healthcare. Certified nurse aide workers are currently in demand due to the recent increase of the number of people requiring assisted living due to illness or old age. With the help of technology and recent advances in medicine, more and more people are able to survive longer lives and they require the assistance of nurse aides. The cost of hospitalization which is very high compared to nursing facilities has also created the demand for more workers in this type of occupation. Certified nursing assistant training aims at providing the needed education and skills which is required in order to deliver efficient nursing aide services. The students are given both classroom and practical training at a licensed nursing facility in order to provide exposure to the real working environment of a nurse aide. The number of total training hours will vary depending on the school or institution. The certification exam is also given the New York State Department of Health and they require a high school diploma, state and federal background check, physical competence to do CNA job, and a negative result for TB tests and for other communicable disease. You can visit this page to read more about the nursing assistant certification requirements in New York. Where are Nurse Aide Schools in New York? 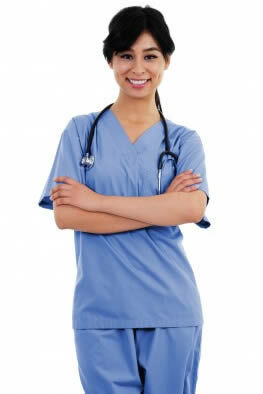 Nursing assistant schools are found in many different cities throughout the state of New York. Some popular facilities include, Laguardia Community College offers a 135-hour course with 30 hours in practical training and 90 hours for classroom sessions; Hostos Community College offers 140 hours which is completed within 26 sessions; Manhattan Institute offers 130 hours of training. Whatever school or facility you may happen to choose, remember to ask if they are approved by the New York State Department of Health. You can find many nursing homes that are willing to provide training and offer you a job upon your successful certification. How Much Money Does a Nursing Assistant Make in New York? There are currently around 100,410 nursing assistants in New York State. The average annual salary for a nursing assistant in New York is about $31,830 and this can be higher or lower depending on your location, type of employer, and length of experience in the field. This equates to an hourly wage of approximately $15.30. Employees generally earn a higher salary in NY than the national average. There is a projected need for almost 400,000 new nursing assistant nationwide by the year 2016. What are the Job Duties of a CNA in NY? CNA courses include subject areas such as Anatomy and Physiology, Resident’s Rights and Independence, Mental Health, Basic Patient Care, Emergency Procedures, Nursing Aide Skills, and Restorative Care. They are responsible for feeding, grooming, and bathing patients as well as answering patient calls, transferring of patients, cleaning rooms, taking of vital signs, and provide assistance to a patient’s exercise routine. They can also administer medication if allowed by their supervising physician or nurse. All of a nurse aides work is done under their medical supervisors. Aside from that, there are also other skills which are needed in nursing assistants such as critical thinking and listening and communication skills. How Much Is Nursing Assistant School Training in New York? The training costs for CNA school instruction can quite expensive in New York. Laguardia Community Colleges charges $960 for the course which does not include fees for the textbooks and Hostos Community College has $995. Other colleges can charge you up to more than $2,000 for the training.